Sansevieria trifasciata 'Hahnii' or Birds-nest Sansevieria is a sport of Sansevieria trifasciata 'Laurentii' found in New Orleans in 1939 with an entirely different habit. They form a low growing, vase-like rosette of broad elliptic spirally-arranged leaves. Plants form clumps growing to 12 inches tall with an equal spread, are very robust and sucker freely. Blooming Time: The flowers are greenish-white and are on 18-inch spikes in spring. Culture: Sansevieria trifasciata 'Hahnii' are easy to grow and tolerate a wide range of conditions. We use a soil mix consisting of 3 parts loam to 1 part sand. The plants are very drought tolerant and are watered about every other week during the growing season. They are fertilized once during the growing season with a balanced fertilizer. During the winter months they are watered once a month. Propagation: Sansevieria trifasciata 'Hahnii' will survive in a wide range of conditions. They tolerate low light conditions and are very drought tolerant. In the greenhouse, we grow ours under 52% shade with a soil mix consisting of 2 parts peat moss to 2 parts loam to 1 part sand or perlite. Plants are watered every other week during the growing season. Too much water tends to rot the plants at the soil line. Plant are fertilized only once during the growing season with a balanced fertilizer. 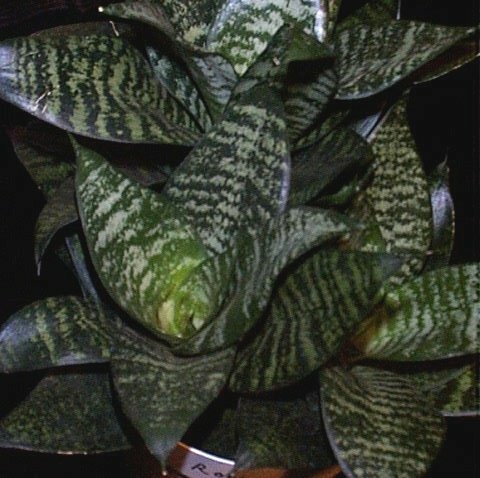 Sansevieria trifasciata 'Hahnii' was featured as Plant of the Week January 18-24, 2002. Cal's Plant of the Week was provided as a service by the University of Oklahoma Department of Microbiology & Plant Biology and specifically the late Cal Lemke, who used to be OU's botany greenhouse grower and an avid gardener at home as well. If the above links don't work, then try the overview site. You may also like to look at the thumbnail index. ©1998-2017 All rights reserved.